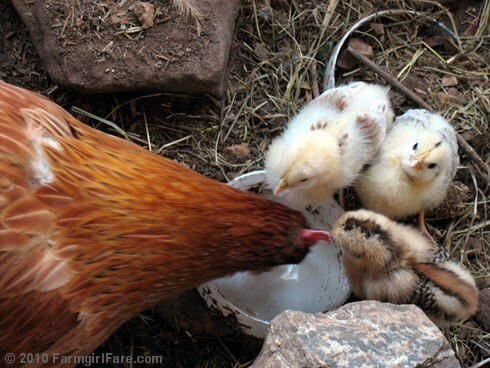 Farmgirl Fare: Sunday Dose of Cute: Peep! Peep! Peep! We really enjoyed watching our hen take care of her chicks. Fun to see it on your blog. We'll be raising several feed store chicks this spring. That chick looking up to the camera deserves it's own picture. How cute. Super Cute! What's the story on that little one with the stripe down its back? I really think it's neet. Ahhhh, thank you. Now I have my daily chick fix. I am speechless. THOSE CHICKIES!!! So cute! I love those little peeps. Hello! I have been reading your blog for almost a year and enjoy it. I need to tell you that your bran muffins are the BEST! I have made them as the recipe states with pears and ginger. I also have made them with pineapple, coconut and macademia nuts; with peaches, with fresh cranberries and pecans, with pumpkin and raisins, and the last batch was with cherries, dates and walnuts. It is a very forgiving recipe and I thank you for sharing it. I'm on the other side of the world from you (I have chook's too) and just wanted to know your blog is truly beautiful, I grew up on a small hobbie farm with goats, chickens, lambs and a pet Magpie, and your photos remind me so much of the childhood I loved...thank you for showing me your wonderful world, From Rebecca in New Zealand. Those chicks are just so stinkin' cute!! Makes me want to run out and add some to my 4 girls I already have. These chicks are just adorable! I have to ask though, is that chick in the middle (looking straight at the camera) the same one mugging for this post?